If you try to work with Rekonq or Konqueror in Google+ or many other Google Services, you'll end up getting warnings about unsupported, legacy browser, or even get completely blocked out, like in Google+. I tried to set another User Agent, without much success. They all force the same warnings at Google. Before I manually add some totally wrong identifications, I messed with the secondary settings. And you won't believe it. It worked. It's so simple. As soon as I unchecked the "Add machine (processor) type", it worked. I'm pretty sure it's a combination of settings, so here in the screenshot you see how it works with Google. Send identification and only check "Add operating system name". 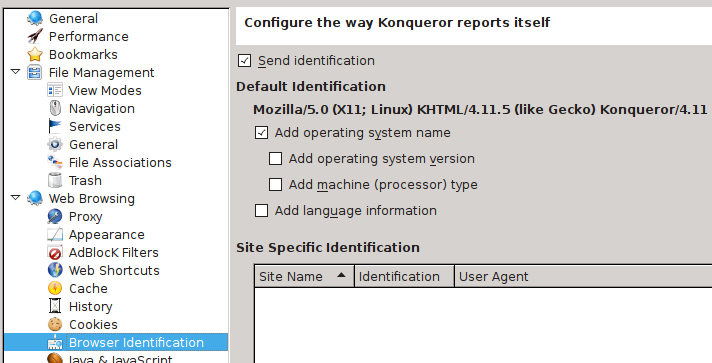 Don't look for this setting in Rekonq, you have to made this settings in Konqueror. It also applies to Rekonq then. YouTube Portal: Works, very laggy.